The Castello di Meleto estate consists of 2,470 acres of land, of which 400 acres are dedicated to vineyards. 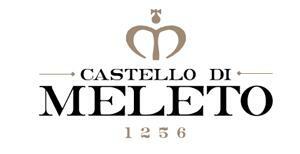 Castello di Meleto is owned by Viticola Toscana, a joint-stock company controlled by the Schuler family. With the support of the Schuler family, Castello di Meleto has renewed its estate philosophy. Located not far from the boundary between the ancient Republics of Siena and Florence, just over a half mile from Gaiole in Chianti, the castle at the heart of the estate once belonged to the Benedictine monks of the Coltibuono Abbey. The name "Meleto in Chianti" can be traced back as far as 1269 when it was under the property of the Rainerii de Ricasoli family. Today, Castello di Meleto's vineyards are spread in five separate plots that surround the castle, leaving the winery in an ideal central location. In recent years, Castello di Meleto has made many improvements in order to better produce everyday, food-friendly wines that embody the character of this unique land and the Tuscan lifestyle of food and wine. The prevailing varietals are Sangiovese, destined to the ­production of Chianti Classico wine, Merlot, Cabernet Sauvignon, Syrah and other traditional varietals. However, replanting efforts using carefully selected clones, have focused on replacing some international varietal vineyards with native varietals in an effort to emphasize the region's unique character in the final wines. The soil is mostly marl, calcareous marl and alberese. It is in this barren land that the vines give their best fruits, full of natural aromas and a distinct ­minerality that distinguishes it from some of their peers in the Chianti Classico. With the addition of enological consultant Emiliano Falsini to the Castello di Meleto team, the offerings from Castello di Meleto have evolved and expanded to include a Chianti Classico that blends Sangiovese with the lesser-known, but indigenous Alicante and a refreshing Sangiovese rosato produced using the Salasso method. James Suckling 91"A red with beautiful dried fruits, terracotta, chocolate and hints of iron. Full body with fine tannins and a slightly dusty texture. Drink or hold. "~J.S.